LocalBitcoins is the leading P2P Bitcoin trading platform with over 1 000 000 registered users from 249 countries. 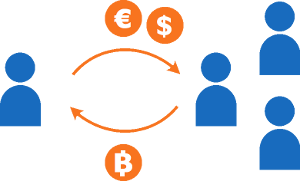 On LocalBitcoins.com you can trade Bitcoins for traditional currencies through person-to-person trades. This is also known as over-the-counter (OTC) trading. People prefer to buy and sell Bitcoins OTC because it allows for fast transactions and more diverse payment methods. Centralized bitcoin exchanges are slow and cumbersome, trading directly with other people using the same payment provider makes the money move much faster. This creates a better user experience for the customer. Hundreds of Bitcoin traders from all over the world already earn a living trading Bitcoins on LocalBitcoins using more than 60+ payment methods, this guide will help you become one of them. A typical trade on LocalBitcoins works like this, the example is an online sell trade where you're selling Bitcoins to a buyer. The process is similar when you are buying Bitcoins online, but for this example we're focusing on selling Bitcoins, as that's the most common type of trade. First you need to create a sell Bitcoins online advertisement (called an online sell advertisement). When making the advertisement you choose a payment method, set your pricing, your limits and write your terms of the trade as a free form message. Then you need to fund your LocalBitcoins.com wallet with Bitcoin. You need to have Bitcoin in your LocalBitcoins wallet in order for customers to be able to open trade requests from your advertisements. When a buyer opens a trade with you, Bitcoin for the full amount of the trade is automatically taken from your wallet into escrow. Give the buyer payment instructions and guide the buyer through paying for the trade. You will receive email and SMS notifications when someone replies to your advertisement. Once the buyer has paid and pressed the I have paid button you will receive a notification via e-mail, SMS and on the website that a trade has been paid for. When you've confirmed that you have received the payment it's time for you to release the Bitcoins. This moves the Bitcoins from escrow to the buyers LocalBitcoins wallet. The final step is to Leave feedback for the buyer and encourage the buyer to do the same for you. Feedback is important in order to gain reputation and make more trades. Before you start trading you need to consider what payment methods you are going to provide and research the payment method so that you know how it works. When you first start trading we recommend you don't choose a high risk payment method. Transfer with specific bank can be a good starting payment method, especially if there are few traders active in your country. A few sections down is more information about different payment methods and their risk level. If you have a new account with no previous trading history, we recommend you start by replying to existing advertisements in order to buy and sell some Bitcoins. This will help you get a hang of how trading works and it will let you build some trading history which will make your account trustworthy which in turn gives your advertisements better placement in the listings. Just starting out? Get some trading experience, with a brand new account it will be hard to find users to reply to your advertisements. Start out by contacting other traders ads to buy and sell, this help you get your first feedbacks and trade completions. The more trades and feedback you have, the more trustworthy you are. It's also a good idea to verify your account by completing both the SMS verification and ID verification. A verified account is more trustworthy for buyers and will help you get more customers. Before you start trading make sure you familiarise yourself with your local legislation and that your are in compliance with any relevant laws and that you have the necessary business licenses for the jurisdiction you’re trading in. Legislation varies a lot from country to country and whether your trading as an individual or as a business. Research the payment method you're going to offer. Read through other traders ads of the same payment method and make some trades with them. Try to identify possible problems before you start trading. Searching the discussion forums is also a good idea. We recommend you start trading using a low risk payment method, see more about payment methods below. Use payment accounts only for Bitcoin trading. Some payment providers will temporarily or permanently close your account if you receive unauthorized payments that are related to fraud. Using accounts only for Bitcoin trading protects your personal finances. The advertisement creation page is where you create new advertisements. You can also find this page from the post a trade link in the menu bar. There are some options when creating an advertisement which are required, and a lot of extra options which are optional but recommended to set. Using the extra options allows you to tune your advertisement to suite your trading strategy. You can find all of the advertisements that you have created from your dashboard, you can also find it from the dashboard link in the menu bar (from the icon that looks like a speedometer). In your dashboard you can also see all of your trades, both open and closed. You need to set a location, currency, payment method, price, limits and write a terms of trade. You need to have at least 0.04 BTC in your LocalBitcoins wallet for your advertisements to be shown publicly. You can create up to 5 advertisements at a time. For each Bitcoin you trade during 30 days you can create one additional advertisement. Enter the country where you want your advertisement to appear. Select the payment method you want to offer from the dropdown menu. See more in the section about payment methods. Choose which currency you're selling for. For instance, if you're selling in France you should select EUR. You can use this list to find what your currency acronym is. The easy way to price your advertisement is to enter a margin you want above the Bitcoin market price. To do that, enter a percentage in the margin field. If you want more control over your price, you can use the price equation field. This will allow you to create an advanced pricing algorithm taking into account many variables. See more in our pricing guide. The minimum transaction limit sets the smallest amount someone can buy. If you set it to five, and you have your currency set to EUR it means that smallest trade someone can open with you will be for 5 EUR. The maximum transaction limit sets what the biggest trade that you want to accept is. Note that if you put in a larger maximum than what you have Bitcoins for in your wallet, the actual maximum will be your wallet balance. This is the text the buyer sees before he opens up a trade with you. It's a good idea to write instructions for the buyer on how you want the trade to proceed and if you have any specific instructions. If you require, for example, the buyer to submit a receipt as proof of payment before you release the Bitcoins or if you need the buyer to provide an ID, this is the place to mention it. You can take a look at other traders advertisements for the payment method you want to use to get an idea of what good terms of trade contain. You can restrict the advertisement to only being able to open trades for specific amounts. If you enter 20,30,60 into the box a potential trade partner could only open a trade for 20, 30 or 60 EUR. No-one likes it when someone doesn't reply. By setting your opening hours you can limit the time when your advertisements are shown to exactly those times when you are ready to trade. Tip: Set the times acording to your own local time, but first make sure that you have your own time zone set in your user settings. Enter here specific information relating to how the buyer should pay, this can be your bank account number or e-mail address (For e.g. PayPal). You can set a minium required Bitcoin trading volume before a user can open up a trade request for your advertisement. If you set this to 0.1 BTC it will require the person contacting your advertisement to have previously completed trades totalling at least that amount. Similar to Minimum volume, the feedback minimum allows you to set a minimum required feedback percentage required to have in order to open a trade using your advertisement. This is a specific maximum transaction limit for new users. If a new buyer with no previous trading history wants to contact you, this is the largest amount they can open a trade for. This option works in combination with new buyer limit. If you set the previous option to 0.5 BTC and the transaction coefficient to 1.5 it will slowly raise the maximum amount that the user can purchase from you. For the first trade it will be your new buyer limit, for the following trade it will be 1.5 times the new buyer limit, or 0.75 BTC for our example. This shows an automatically generated reference code for the trade. It's a convenient feature to use as the buyer can enter the reference as part of the message when purchasing, allowing you to quickly match payments to trades. Let's you select what kind of reference to display. You can select between short, long, numbers & letters. How long of a time the buyer has to make payment before the trade is automatically cancelled. In case you are offering Bitcoins for sale using a payment method that only allows you to accept a certain amount a day you can use this feature to limit yourself to that. Enabling tracking liquidity lowers the maximum limit of the advertisement each time someone makes a purchase. By marking this checkbox you limit the advertisement so that only users who have verified their ID with LocalBitcoins are able to open a trade. By marketing this checkbox you limit the advertisement so that only users who have entered a real name on their account are able to open a trade. This is only availalbe for Online Sell advertisements. By marking this checkbox you limit the advertisement so only users who have verified a phone number with us can open a trade. Marking an ad for trusted users only allows you to create special advertisements for users whom you have trusted. See more in our FAQ. If the buyer too is slow or non-responsive. The escrow is automatically cancelled unless the buyer presses Mark payment done within the payment window (usually 90 minutes). If this was a mistake in this case you can reopen the escrow if you want to finish the trade with this buyer. Dispute the trade If there are any disagreements in the trade, you can open a dispute. After a dispute has been started you can still release the Bitcoins and finish the trade e.g. in the case the payment took longer than usual to arrive and dispute was opened prematurely. Not replying to trade offers can give you negative feedback. Turn off your advertisements when you're not trading. Tip: use the opening hours feature to automatically turn on and off your ads as you are available. Below is the list of currently supported payment methods on LocalBitcoins.com. If you are thnking about selling bitcoins with a certain payment method, check its risk level and read the topic on risk mitigation below. If you want to see a new payment method added or have questions about the risk of a payment method, please contact LocalBitcoins support. It's a good idea to research a payment method before you start trading with it. Familiarise yourself with the terms of service and search online for other trader's experience with the payment method. These risk levels apply only when you are selling bitcoins online as the risk comes from accepting payments that can later be charged back. When you are buying Bitcoins you are completely protected by escrow as long as you have proof of payment. Low The payment method is irreversible or almost irreversible. It is safe to use this payment method, LocalBitcoins are aware of few or no issues with it. Medium The payment is reversible and LocalBitcoins receive the occasional report of fraud. Set first time buyer limits. Require reputation and account history. Check the ID of the buyer. High It is easy for the buyer to reverse the payment, reversals can occur weeks or months after the trade. The payment provider may lock your account without a refund after receiving payments for Bitcoin. LocalBitcoins are aware of several cases of fraud or other problems with trades. Proceed with caution. Set very low first time buyer limits. Require high user reputation and long account history. Unknown LocalBitcoins have not researched this payment method or there is little to no history with it being used for Bitcoin trading. You can ask in our forums about these payment methods before you start trading. It's important to having good digital security, but it's especially important when you're trading Bitcoins. When you have advertisements up selling Bitcoin you also tell the world that you have Bitcoins, which can make you an attractive target to cyber criminals if you don't have your security in check. Most common attacks are done using spear phishing techniques. That's where the attackers will first attempt to get access to other services that you use, mainly your e-mail or cell phone account. From there they will try to get access to your financial services. This is why it's very important to keep all of your online accounts secure, not just your LocalBitcoins account. By following these steps you can be sure that your account is protected from most security threats. Enable Login Guard from the security settings of your account to prevent logins to your account without an e-mail confirmation. This is not enabled by default for older accounts, please make sure it is turned on. Enable Two-Factor authentication on your LocalBitcoins account, this adds a second layer of security in case your password falls into the wrong hands. Make sure you do not store the backup code electronically, write them down and store the code safely. Enable it from your security settings. Use a different e-mail address for your LocalBitcoins account that is not used for anything else. Don't give this address out to your customers, use a separate e-mail account for customer correspondence. Gmail accounts are good as you can protect them with two-factor authentication. Review your login history & authorized browsers. From the account security settings you can view your account Login history and authorized browsers. It's a good habit to check these from time to time. Be wary of any images, links and other files that customers or unknown people send you, it can be an attempt to infect your computer with malware or worse. Run periodic malware and anti-virus checks on your computer. Don't use the same password on more than one site, instead use unique and randomly generated passwords. A password manager, like KeePass, allows you to do this without having to remember all your passwords. Using the same password on more than one site very dangerous, it can allow an attacker to get access to many of your accounts by knowing only one password. Enable Two-Factor authentication on services that support it, Google, Facebook, Dropbox all support it. Educate yourself on cyber security. Having knowledge is probably the best defence, read up on common attack techniques such as spear phishing to know how to identify potential attacks. If you are selling Bitcoins for a payment method that is reversible you should verify that it is the buyer who is making the payment with his own account. When you receive a new trade, take a look at the buyer's LocalBitcoins profile to gauge the reputation of the buyer. Go through the buyer's previous feedback and his trading history. On the page for the trade itself you will see a box showing security information of your buyer. Always view this information to get a picture of who your trading partner is, check whether the real name of his account matches the name attached to his payment. Check that the users IP address is from the same country as the payment is coming from. Below is an example of what the security information box looks like. If you're selling using a payment method such as transfer with specific bank where the buyer's name is visible, limiting your advertisement to only users who has verified their ID with LocalBitcoins is a good idea. A large part of fraud occurs from new accounts. Setting first time buyer limits on your advertisement helps you limit the risk you expose yourself to and any potential damage from fraudulent buys. They prevent a no-reputation buyer sending high volume trade requests. Setting the limits itself discourages the fraudulent buyers to contact you. See more above in the section Setting up an advertisement. Most of online payment methods are reversible. The payment provider can take back a payment even after it has arrived to your account. For example, PayPal payments are reversible up to 180 days. In many countries, online banking is not protected by two-factor authentication. This means that whoever gains the control of user computer, using malware or otherwise hijacked computer, can do unauthorized bank transfers. This is an issue for SWIFT, SEPA and wire transfers. Receiving money from a stolen source may lead to freezing your bank accounts for the duration of criminal investigation. The way to mitigate this risk is to check that the buyer id matches the sender bank account name. Scammers take advantage of the fact that Bitcoin transaction are irreversible or they try to trick you into releasing Bitcoins without sending payment. That's why it is important to never release Bitcoins from escrow until you have payment. Even if it's a regular buyer and someone you know, as once the Bitcoins have been released from escrow, there is no way for you to get them back. With reversible payments, scammers will attempt to pay using stolen credentials or purchase proof. 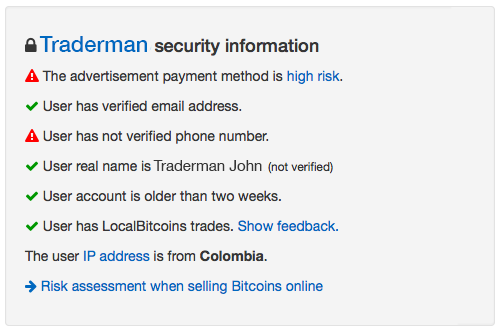 Requiring the buyer to have ID verified their LocalBitcoins account, and always checking that the users real name matches that of the payment information helps you stop these attempts. In case you encounter a suspicious user you can always open a dispute for the trade and LocalBitcoins support will help you ensure a safe trade. Fraudulent buyers are often in a hurry. The more a customer asks you to hurry/rush the more suspicious you should be, real customers always have patience. Fraudulent buyers often suggest doing all or part of the transaction outside escrow and then do not complete their part of the transaction. Be careful about photoshopped payment evidence, don't release Bitcoins until you have confirmed that you have received the money. You are not obliged to release a trade until you can verify that you have received the buyer's payment. Don't open any links that your trading partner is sending to you. If you must, use different browser than the one you are using. Don't visit websites other than LocalBitcoins.com with the browser that you're using to trade. Use a different browser for other websites. Bookmark LocalBitcoins.com in your browser and always use the bookmark when visiting the website. This helps you avoid accidentally visiting phishing websites, they exist and can be very convincing. Even experienced traders have fallen victim to phishing websites. If you're unsure about a user, you can always contact support for help. LocalBitcoins.com support handles disputes based on evidence supplied by trade participants and their reputation. Disputes can be started 1 hour after payment is marked complete. If the buyer has fewer than 3 completed trades, the seller may open a dispute after 1 hour. After the escrow has been released by the seller the trade is considered finished by LocalBitcoins.com and cannot be disputed. When a Bitcoin seller is unresponsive, LocalBitcoins will release the Bitcoin to the buyer if the buyer can provide valid proof of payment. If the buyer is unresponsive after starting a trade, the escrow will released to the seller by LocalBitcoins support. LocalBitcoins wishes you happy trading!